"Where's this? asked Skratch. "It's the Wabbit's homeland," answered Quantum the Time Travelling Train. "Off you hop now and have a nice snack!" So while they assembled round a table, Skratch thought he would get the drinks. "Carrot aperitivi," he called in a loud cat voice. "Oh I don't think they have these here," said the Wabbit, "but I do see something else." "So do I!" said Ghost Bunny, "it says Irn Bru on the label." 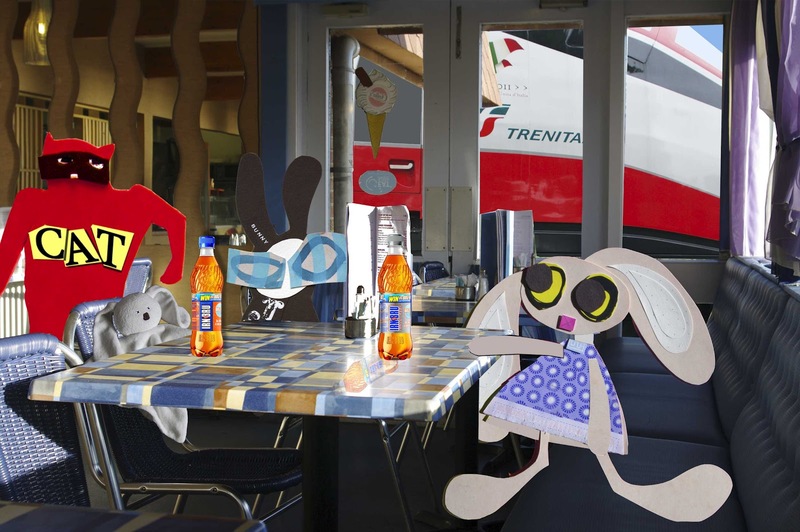 "Made in Scotland from Girders," said the Wabbit. Lapinette giggled. "And how do they do that exactly?" she smiled. Lapinette was merely teasing, because she had found the Wabbit's secret stash of Irn Bru in the back of a cupboard along with a sporran, a skean dubh and a tartan football hat. Of this discovery she said nothing. "Irn Bru is so made of girders," said the Wabbit following a pause. "It contains ammonium ferric citrate!" "Point nought nought two percent," said Ghost Bunny quietly. "Exactly," said the Wabbit. "It puts fur on your chest, so will you join me in a glass?" "Me too," said Quantum the Train and they all settled back. "So what about the Ice Mice? What kind of adventure was that exactly?" asked Skratch. "It was an Eco adventure," said Ghost Bunny who took an interest in popular television. "The Skarrots was an Eco adventure too," said Lapinette. "Are we getting in a rut, then?" asked Skratch. The Wabbit sipped his drink and smacked his lips. He knew only too well that Lapinette had discovered his secret hoard of Irn Bru because he was one bottle short. "No, it's more of a groove," he grinned.